My Queen Anne's Lace bare root plantlings arrived today! I just finished planting them in an indoor planter box to recover from being mailed (oh hugs! my sweet darlings) and to grow until it gets warm enough to move them outside into the spring sunshine. I ordered six plantlings - I received seven regular sized plantlings and another eighth teensy little baby plantling whose roots were tangled up in one of the other plantlings - that is so sool and mystically significant to me! I separated the two plants and planted each side by side so that each plant's roots could have space to develop. 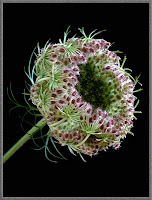 Queen Anne's Lace is also called Daucus carota, wild carrot and the Bird's Nest. A flowering plant native to the temperate regions of Europe, this plant is also a significant ethnobotanical in Celtic folk tradition. 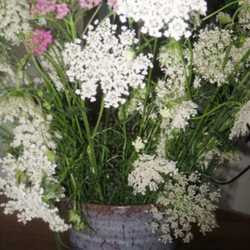 Considered a weed in the USA, Queen Anne's Lace is beautiful to me. As an herb, Queen Anne's Lace can be used to make a natural yellow dye (as woad is used to make Celtic blue dye), medicinally (as a contraceptive, diuretic, antiseptic or digestive aid), and shamanistically as an hallucinogenic. It has been so long since I've had a garden, and this year's will start small. Queens Anne's Lace, as the first plant in my new garden initiative, has initiated a new cycle in my life and my return to the traditional herbalism of my Celtic ancestors. I'm in love with my little plantlings! Check out the new design for my craftwork blog, now called WITCHCRAFTS by Liorah Lleucu! I'm redesigning the layout and focusing it as grimoire blog for my Etsy shoppe. I'm still working on it, but it's coming along nicely I think! It is amazing the power unleashed within my life by simply purchasing some woad. In follow-up to my woad purchase and the subsequent dream where I, like an eel I discovered, returned to Avalon in the Sea, I've now discovered another connection of my "Avalonian eel" dream to the Celtic mysteries! Celtic legends abound in regard to the Eel and the Book of Kells mentions them many times throughout, as creatures that can change form by growing legs and walking on land for great distances, only to shift back into their familiar snake like form and return to the sea. Shape shifting, adaptability, wisdom, inspiration, watching unseen, ability to overcome great obstacles, change, travel, fertility, stamina, and endurance. Eel Animal Pearls are said to impart their particular magical virtues to their owner. Eel Pearls are characteristic of its host animal; they possess all the awesome characteristics that may be seen in the Eel itself; the adaptability and mysterious elusiveness of the Eel is contained within the pearl waiting for its proper owner to bestow its inner magic to that unique and fortunate individual. For century’s shamans, wizards, witches, spiritualists and practitioners of the occult have used Eel animal pearls to transfer the powerful magical energy of the Eel to themselves and to others in need of its special magic. Eel pearls are highly sought after by any wishing to absorb Eel virtues into their lives and develop stronger mental abilities such as those embodied by this snake of the sea. The owner of an Eel pearl will see their lives, spiritual energy and mental clarity imbued with all of the virtues attributed to the Eel. The Eel animal totem is a strong spirit and its magical properties are one of the most interesting of all animal totems. Adaptability, fertility, inspiration, and so much more can be integrated into the spirit of the possessor of this magical pearl and the Eel totem. What I didn't mention in my previous post about my dream was that earlier in the day of the woad-inspired dream, I had received my DVD copy of The Secret of Kells in the mail, and that later that evening just minutes after purchasing the woad, I had watched the film! What amazing synchronicity! And now my eel is not just any ole eel, but an eel with connections to the secret of Kells. And the wisdom coming through my dream is its pearl. And bright ships left you this or that in fee:"
This morning, on the heels of acquiring my first batch of woad, I dreamt. Of Avalon. I was pure spirit in the dream and being shown about the Island paradise, both up close and from a place hovering over the surface of the earth from a distance from which I could see entire continents. Avalon was both ancient and new, still in existence. It was explained to me that the island was so exquisite because it went through cycles of cataclysmic renewal. Each cataclysm served to rebirth and further the evolution of the land in ways not given to other lands. This is why Avalon was so much more evolved and beautiful than other lands. Its evolution was focused, directed and managed with Active Will. I was also shown that Avalon as an island lay in the middle of the Sea to the east off the eastern shore of South America, at least according to the arrangement of the lands as we currently experience them in this epoch of the planet. I woke up, and looked up a world map to see what was in the sea off the eastern shore of South America now. The Atlantic Ocean is there. Investigating further, one interesting fact about the Atlantic Ocean is that there exists inside the ocean sea another sea called the Sargasso Sea. The Sargasso Sea is the only sea in the world without shores. Its shores are in the mist to the common mind, hidden within the waters of eternity. The ocean water in the Sargasso Sea is "distinctive for its deep blue color and exceptional clarity, with underwater visibility of up to 200 feet (61 m)." The Sargasso Sea also plays a major role in the migration of the European eel and the American eel. The larvae of both species hatch there and go to Europe or the East Coast of North America. Later in life, they try to return to the Sargasso Sea to lay eggs. Perhaps my consciousness has returned there like the eel, to its origin on this planet, to lay an egg for a new period of evolution in my existence as a timeless Being in time. Another interesting fact about the Sargasso Sea - within it lays the notorious Bermuda Triangle. Taking all this together, I think my life is entering a new beginning unlike any other I've ever experienced in this lifetime. Coming soon to WITCHCRAFTS by Liorah Lleucu - Celtic Woad Blue! Witchcrafted in the tradition of the Old Ways! 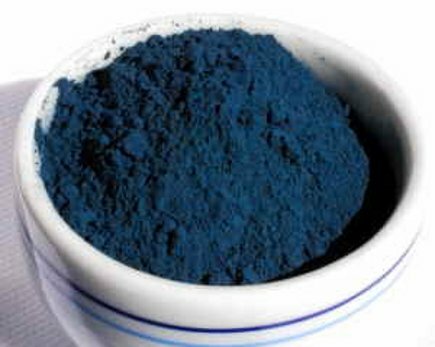 I've ordered materials for making authentic Celtic Blue dye from the woad plant (Isatis tinctoria). Used throughout Europe since the Neolithic times 5,000-10,000 years ago, woad is a source of natural indigo. Famous for its association with the land of the Iceni, the land of Queen Boudicca, medicinally woad has antiseptic and anticancer properties. Research has demonstrated that woad has 20 times more of the anti-cancer chemical glucobrassicin than broccoli. Magically, woad has historically been used for shapeshifting rituals and past life pathworking. Look for this gorgeous blue soon at WITCHCRAFTS by Liorah Lleucu! 9 .. 1 .. 3 .. 4 - does this series of numbers hold any significance to any of my readers? Two nights ago, I dreamt. I was a princess-prince-knight living during the Dark Ages. For some reason, the ruling evil chief-king of the land had decided I was a traitor and put a price on my head, offering a generous reward for anyone who could kill me. It would be difficult for any bounty hunter to kill me as I was undefeated in battle. I was a fugitive on the run. I escaped those pursuing me and made it to the border of the land where it would be harder for anyone to track me - for there it was a wild eerie untamed and enchanted forest full of danger, magical plant life and magical beings. It had a dense thick atmosphere. A river ran through it. No one had ever returned alive from the edges of the land before - few would dare pursue me into this place. The place was beautiful in its raw wildness. Giant trees reached up into the sky - their tops high beyond sight. One giant half-fallen trunk of a tree lay at a diagonal across the river which ran through the place - the ends of the tree trunk I could not see. As I gazed at the tree trunk, it came acutely to my mind that no one had ever escaped the land before and that a party of pursuers had dared to pursue me to the edges of the land into the enchanted forest and had just entered it. I was at the very edge, the very end - there was nowhere else to flee except out of the land - and no one had ever escaped the land before. It was like an immutable law of physics - no one could escape. I stepped upon the trunk of the tree to ponder some way to do the impossible - to escape the land and the bounty hunters intent on killing me. Suddenly, as I had stepped upon the trunk of the giant ancient tree, it flew up (as if catapulted by the touch of my feet) and out of the land like the land had been a world within a lake. I saw it from above the surface of the lake - the land lay beneath the still surface of that which appeared to be like a lake. I saw it from above the land which lay under the surface of a lake like world - I had escaped the land and my pursuers. I had done the impossible. I had transcended the law of reality which said it couldn't be done. I felt like Excalibur, held above the surface of the lake in the hand of the Lady of the Lake like in the movie The Mists of Avalon. I was a powerful witch, powerful in that no one had ever succeeded to kill me. My magical powers were also legendary. I was protected by the Universe. Some group of magical practitioners was trying to find and kill me, but another small band of magical practitioners was trying to get me to a safe land out of the reach of those who kept trying to kill me time after time. The protective group was trying to find a place to hide us all from the murderous magical practitioners who were coming close with little luck. So, I said to my group, "here is the Tree which has hidden me in the past." Then, we all lay down by the base of its trunk, and it pulled up some of its roots and covered us over like a blanket. The killing group passed right by us without an inkling we were there. When the murderous group had gone, we emerged from the embracing arms of the Tree. Yes, the Universe protected and still protects me. 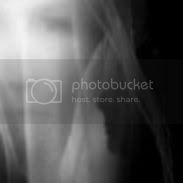 There was some kind of military connection in the dream, like all of us, both those protecting me and those trying to kill me, were part of military groups. There was no fighting, but the military presence and flavor was clear. The personal bodyguard assigned to me by my group's military commanders was a Prince. He had to be a Prince. No one other than a Prince was qualified to be my bodyguard. He went with me wherever I went. Out in the open, one of the black tornado-like energies scouting around in the distance to locate me, did. Many tornado-like black energies gathered in the distance and headed in our direction. One of the new magical practitioners to our group lived in a tree. From inside the trunk high up in the tree, he opened up his magical book of spells to thwart those dark energies heading toward us. My Prince knew the spells would be ineffective to stop the dark energies heading our way, and he said to me, "now is my time to shine." Just then, the dark energies were upon us and they took the forms of entrapping Ice. Everything they touched turned to immobile Ice. One of them captured my Prince and swallowed him up in Ice, blowing its Icy breath with him trapped inside it. I saw that from within the inside of the Icy breath of the Dark force, my Prince had turned into a radiant Sun energy. He was melting them from the inside out! I woke up ... to an Ice storm happening outside. One nearby little town is already without power.